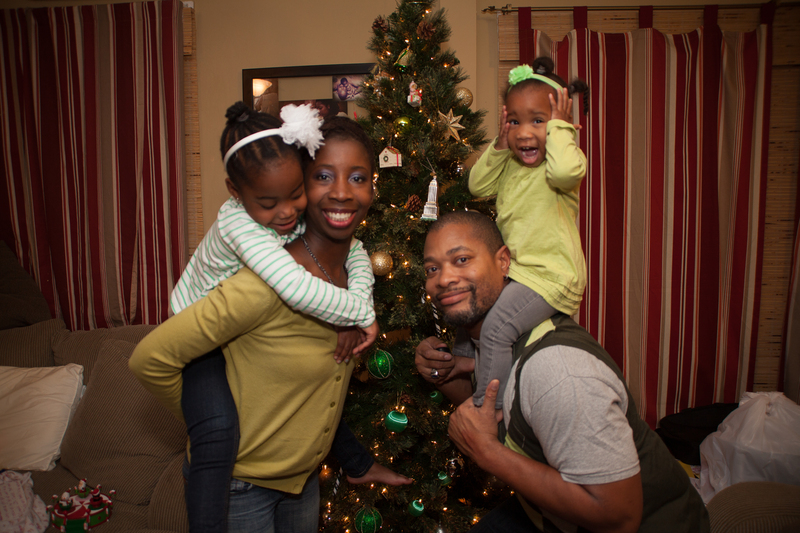 Gobble Dee Gook | That's Greene With An "E"
Parents, we are spending too much time behind the camera not truly enjoying the experiences of our children and… it’s making us rude! Children were dancing blissfully with Dora the Explorer during a dance party. Mother stops the children from dancing so that the children can face her. Mother tells them to “do that other dance you were doing before”, then takes pictures and records. The kids are having fun!!! Why is there a need to stop them from having fun to get the picture you wanted? Why not just get a picture of them as they are – doing what makes them happy. No need to stage your children for the perfect picture. There is perfection in their momentary glee! Mother taking photos of her kid for the millionth time (standing in the same position) walks in front of another parent who is trying to see her child perform. This one is a huge problem. Getting that perfect picture is so important that you would ruin the experience of another parent is unacceptable. UNACCEPTABLE. If your kid is standing in one spot singing a song you really don’t need to take that picture more than once. Take a picture, put the camera down and enjoy the show like everyone else… pretty please! Mother taking photos of her kid for the millionth time (standing in the same position) literally sits on the lap of another parent because she does not see her there. This one really burns because the other parent was none other than Aisha GreenE. Yes, a parent was taking a picture of her child and while trying to get every angle she stepped on Aisha’s foot then sat square on her lap because she just did not notice that another person was around. Sigh. Put the camera down and pay attention to humans. Mother stops watching her child actually perform to watch the video she took of the performance to upload to Instagram. So the kid is performing now, like right now, like now now but instead of enjoying the show … you are posting it before it is done. Instagram will not be going the way of Friendster in the next five minutes so watch your child perform in real time and post later because YOU ARE MISSING THE SHOW! In our family we truly believe in chronicling our life in photos, printing and archiving them – we’ve even blogged about our appreciation of family photos. But… too often we stop our children from having fun so we can take pictures of them having fun; we interfere with the enjoyment of others; and are motivated to post experiences rather than enjoy them. We are actually losing out on quality moments, disruptive to one another and disruptive to our children in our quest for the perfect pictures. You can capture moments without the disruptions. We are not just preaching to other parents, we are preaching to ourselves too… enjoy real life and reel life. She can also recognize the younger versions of the people that she knows. She can pick out Lady C when she was a toddler and Hayden when he was a young man (… and yes, he was once a young man!). She sees her family represented visually all the time. You may have heard the statistic that 90% of all photos ever taken from the invention of the camera until now, have been taken in the last 3-5 years. That’s staggering! It’s a direct result of the advent of digital photography and the fact that everyone has a camera in their pocket these days. Whether this is a good or a bad thing is a topic for another day but it does raise an issue: where do all those photos end up? Printing pictures has become as archaic as typing a letter on a typewriter. Instead of hanging a picture on a wall, most people opt to posting it on their Facebook wall. Instead of sending grandma and grandpa a picture of the newborn family member in the mail, people opt to emailing them a link to the pic on their Instagram page. When someone asks to see a picture of your kids, instead of pulling out your wallet with a bunch of wallet sized photos, most people pull out their phones and scroll through their gallery. It’s just innovation changing the way we view photos…right? Well think about this for a moment: in this new digital age, where do young children see their family represented? They don’t have continued access to phones, laptops, and tablets. They only see these pictures when someone chooses to show it to them or if they ask to view it. I think that it’s important that they see their unit (whatever it looks like: traditional, nuclear, extended, blended, non-traditional, etc) all the time. It tells them that they belong to something and that there are people that love them. Also, it reminds them that their actions affect a larger group than just themselves. Both these things are hugely important to us. But Hayden is an old soul (housed in an old body) so we may just be behind the times!! How do you display your photographs? Do you hire a photographer to take professional ones? How do you share your pictures? Early this year a friend of mine died in a tragic accident while she was on vacation. After her death I became very angry about a lot of things – and quickly realized that I had a pound of regret I was carrying around. During her funeral, the minister challenged us to let go of any regret we had and to put it aside. I burst into tears realizing that I felt horrible that I didn’t get a chance to thank my friend for all she had done for me and for my children. I didn’t get a chance to remind her that I thought she was the bees knees and super funny. Sure, we communicated most days via social media “likes” and high fives but I did not have a VERBAL conversation with her in way too long. And, I would not be able to do it anymore. At that point… Tuesday Two developed. Tuesday Two is one way that I decided to answer my issue of regret and to learn from my mistake. Every Tuesday I CALL (not text, not email, not IM, not tweet, not post)… I CALL TWO people that mean the world to me but I don’t often have a conversation with them and I tell them TWO things that I love about them. It’s pretty simple. I chose Tuesdays because of the alliteration. Sometimes… I just forget things, including doing my Tuesday Two, but the moment I think of it being Tuesday or think or say the word Tuesday I think of my Two. The responses have been amazing – ranging from people crying to laughing to saying – they really needed the call at the moment, it changed their day. It also helps me to reconnect with people in a genuine way. It’s been therapy for me but has also had an impact on the Two people I call. A few people have asked me about Tuesday Two so I decided to blog about it because – it’s had such an impact on me during my grieving process and has helped me refocus and reconnect with people I love and care about. Social media is great – I have no issue with it, but it simply can’t replace the phone call that you need to have. I hate talking on the phone but it’s necessary. If I can help it – I don’t want anyone I love going to the grave without them knowing how I feel about them and what I love about them. But… really, why wait? If someone is on your mind today, call them today, tomorrow is not guaranteed – the only thing we can control is how we treat each other here and now. Now if you know the Greenes, you know we go HARD for Halloween. Family costumes are a must and it’s a secret until the day of! We love All Hallows’ Eve! We also love Christmas but we tend not to be too traditional about it. It really doesn’t matter to us whether we’re at home or on a tropical island for Christmas. But Thanksgiving?! Now that’s the grand daddy of the fall season for us. Hayden is already preparing the menu which includes garlic whipped potatoes, jalapeño Mac & three cheese poppers, and the crowd favorite, bacon wrapped shrimp. 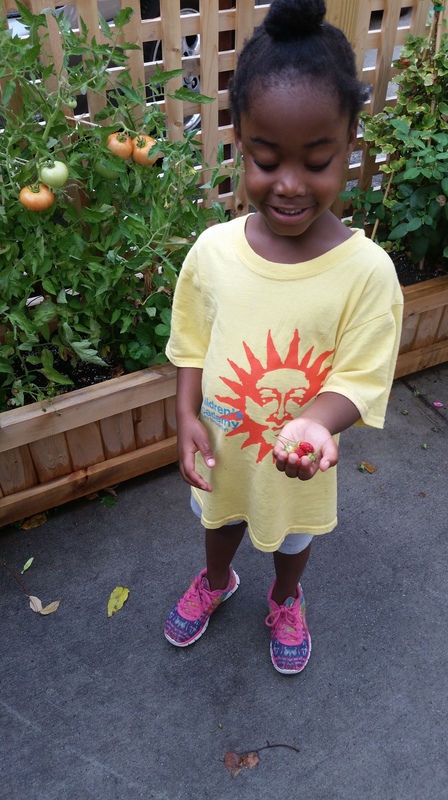 Aisha has planted pumpkins in the backyard and they should be ready to decorate the house just in time. When we renovated the living room, the VERY first thought was how much more space we have for the 20+ people that show up at our house. Speaking of our guests, they are looking forward to this too. Last year, we decided to take a break from BIG Thanksgiving. We won’t be doing that again! It threw EVERYONE’S plans off. And this was with 3 MONTHS of advanced notice!! 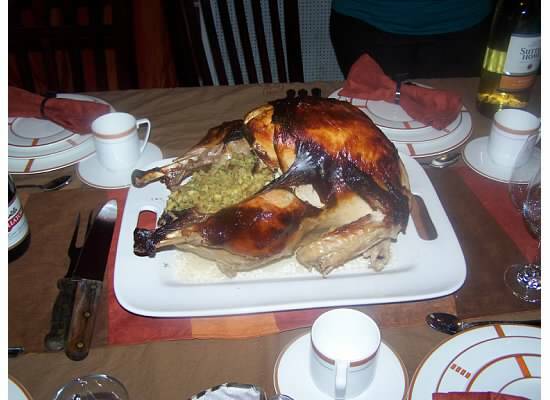 We have already heard from some of the regulars that they are relieved that Thanksgiving is back at the Greene house! SEE!!! We can’t help ourselves. It all leads back to the best meal of the year!! Which holidays are important to your family? Which is your family’s favorite season? Cinderella. Snow White. Ariel. Aurora. Belle. Queen Amina of Zaria, Nigeria or Queen Makeda of Sheba or Queen Nefertiti of Egypt? This weekend we had the great pleasure of learning more about the newly created company “Your Queens” when we had dinner with the creator and owner of the company, Eki. 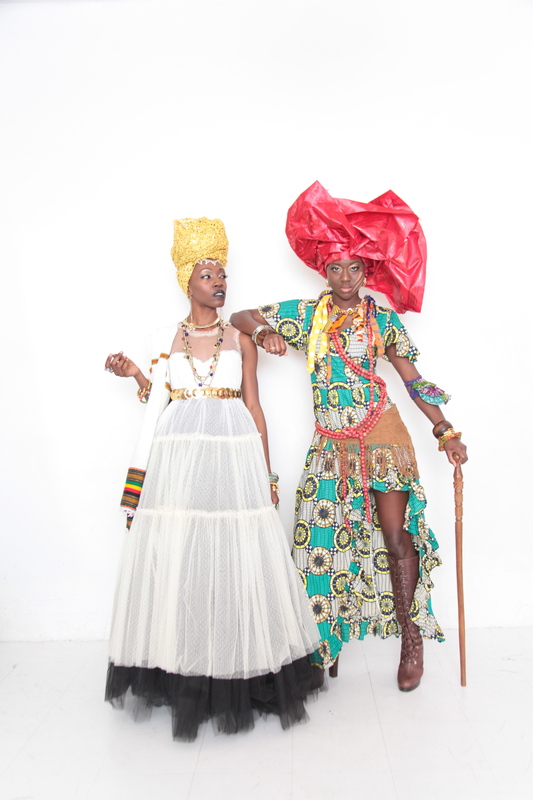 The mission of “Your Queens” is to Evaluate, Educate and Express the dynamic lineage of Ancient African Royalty. 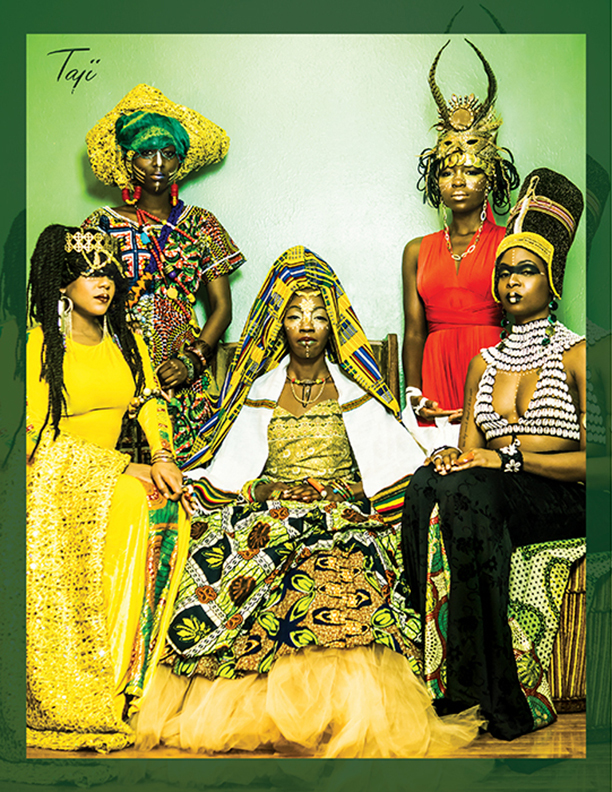 They teach youth and adults about the historic legacy of African Queens through storytelling, song and dance and best of all – they do parties for all age groups! At your party or event, the Queens will come dressed in their royal attire, share history with the audience through storytelling and do a choreographed dance set for children to learn. The party packages (which start at $350) also includes head and warrior wrapping, face painting and musical instruments for everyone to play. When we learned about what Eki was doing we got excited because we are always looking for unique party experiences and this is special. There is an opportunity for cultural awareness, building self-esteem, and building a confidence and pride! Disclosure: This is not a sponsored post. At the moment, this blog is all about what the GreenEs feel, what the GreenEs do and how the GreenEs roll. We met the owner of “Your Queens” in a social setting and she was beautifully dressed after coming from a first birthday party where the Queens were performing. We wanted to learn more and when we did, we asked permission to share. Because – that’s what this blog is all about at the moment. The Share. Hayden grew up in Trinidad and his yard consisted of banana trees, mango trees, plenty of flowering plants and even a chicken coup that he recalls having to clean up. Aisha, on the other hand is puuuure city girl and mostly lived in apartments. Greenery was – houseplants. And if anyone can kill a snake plant or cactus… it’s Aisha. When we purchased our home, one of the appeals of the small backyard area was that it was all CONCRETE and limited maintenance. But it was boring. There was nothing beautiful about the space and it was actually being wasted. This spring we decided to create an urban garden using planters because the majority of the yard is concrete. We removed our old stylish chain link fence and replaced it with a wood lattice fence. 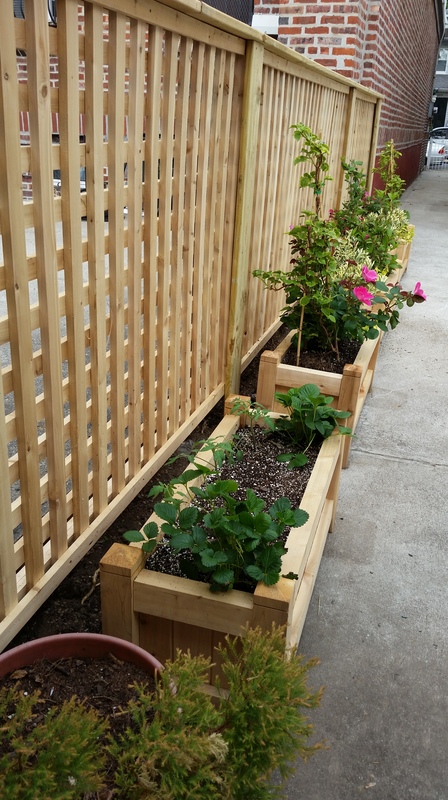 We also added wood planters filled with flowering plants and tomatoes and strawberries. 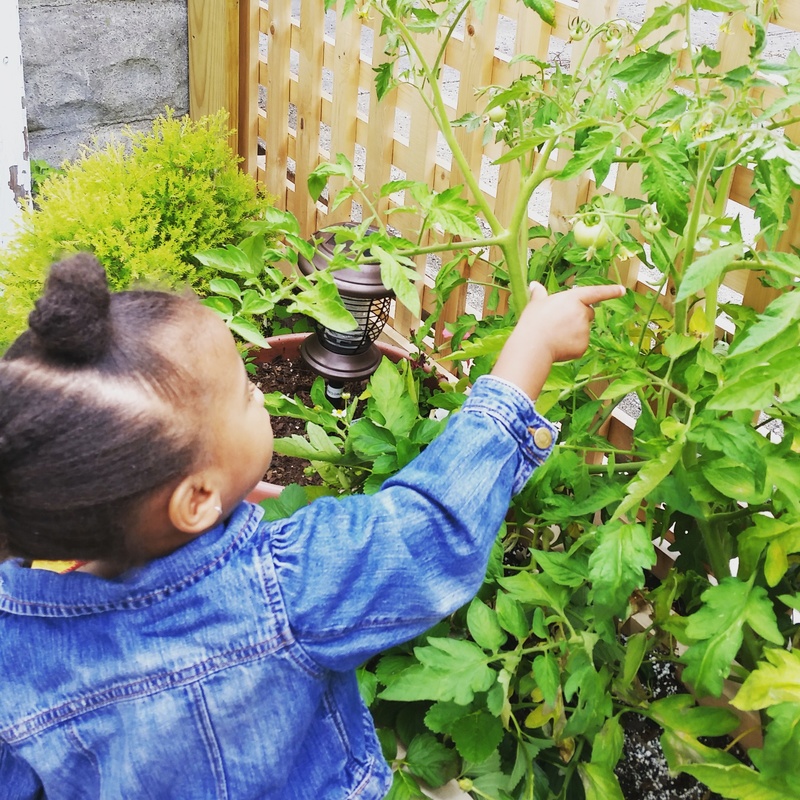 The girls have loved maintaining the garden, watering plants and watching the plants grow. Last night, we finally picked some of the strawberries that finally ripened and we ate those suckers up. So delicious and rewarding to eat what we created. 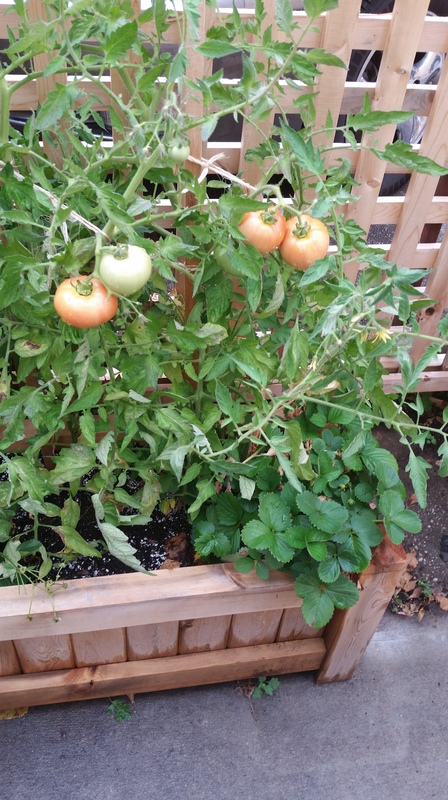 TOMATOES ALMOST READY FOR PICKING – WE ARE GOING TO MAKE SAUCE! WAITING FOR THESE STRAWBERRIES TO RIPEN!!! Maintaining the garden in planters has proven to be super easy – even for a brown thumb. The flowers and plants are growing quite well and TLC is minimal. 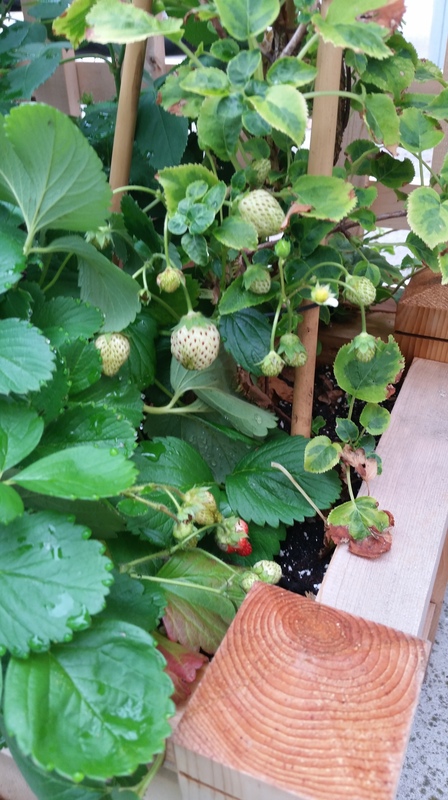 Only issue is the cats and/or squirrels that have been eating our ripe strawberries!!! For all you city dwellers with limited green space or a concrete area, we highly recommend using planters for your garden. 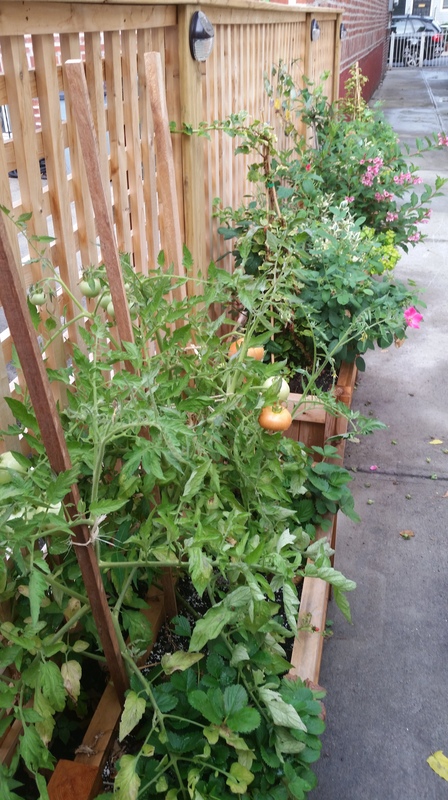 Such a great way to teach science, healthy eating and an appreciation of their outdoor space.